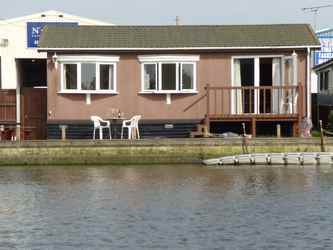 Ballysteen is a self catering, riverside holiday chalet situated in Brundall, just South East of Norwich, on the River Yare. 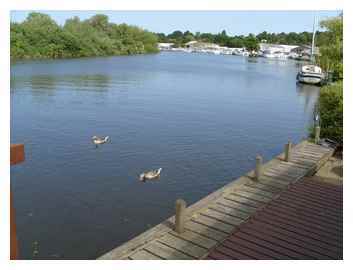 It is in the heart of the Broads, has a station within 5 minutes walk which goes to Norwich in one direction (2 stops) and Yarmouth or Lowestoft in the other. The local pub "The Yare" is a few minutes walk away and serves food 7 days a week. The "East Hills Cafe" is also close by and serves lunches, afternoon teas (including cream teas) and evening meals. The village has 2 supermarkets as well as a choice of take-aways. It is surrounded by good walks and cycle routes. Good bream, perch, pike and roach have been taken from the deck. Boats may be hired or there are regular cruises from nearby boatyards. 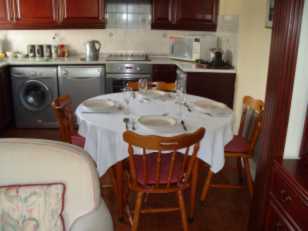 Ballysteen sleeps 4 guests in 2 bedrooms each containing a double bed. It is a fully equipped home including free Wi-Fi, Freeview TV, Freesat TV, DVD, radio / cassette / CD player, washing machine, dishwasher, fridge, microwave, hairdryer and sufficient glasses, cups, plates and cutlery for your needs. 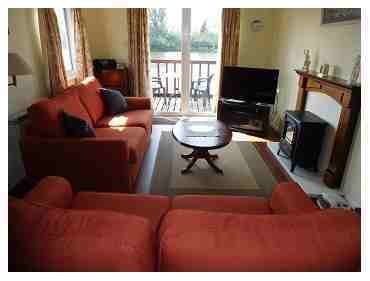 The river side has an upper and lower deck complete with outside tables, chairs and sun loungers for your use. 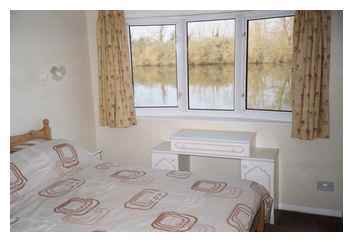 All bedroom linen is provided plus a choice of Summer or Winter duvets, but you will need to bring your own towels. The bathroom has both bath and shower. There is parking for one large vehicle. For those who plan to fish rod pods are provided (fishing license needed, close season 15 March - 15 June). I am sorry, but no pets are allowed: this is both for the benefit of later guests and to protect furniture and fittings as even the best behaved pets have "accidents". Children are welcome but the river presents an obvious danger and guests need to consider how they can ensure their children's safety. No smoking is permitted inside the chalet but guests may do so outside. Bookings: All weeks start and finish on Saturdays. Arrival is on or after 3pm and departure on or before 10am. A deposit of £100 per week is payable to secure a booking and the balance must be paid 6 weeks prior to arrival date. If the booking is cancelled prior to 6 weeks the deposit will be forfeit. If cancelled within 6 weeks of the arrival date, the total payment is forfeit. As a matter of goodwill, a refund less the deposit will be made if another guest takes up the booking. Guests may consider taking out holiday insurance if this is a concern. Ballysteen is unavailable due to building work on neighbouring site.